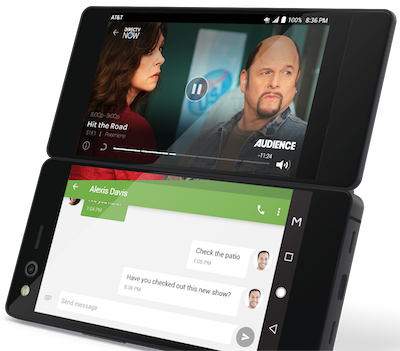 ZTE’s Axon M on AT&T is the company’s latest and most innovative flagship android smartphone, with two full sized folding screens. Its quad-core Snapdragon CPU nicely powers those screens for simultaneously watching video and running apps. A sealed 3,180 mAh battery is rated for up to 28 hours of talk time. The ZTE Android smartphone comes with two 5.2” Full HD screens that fold on its right side. 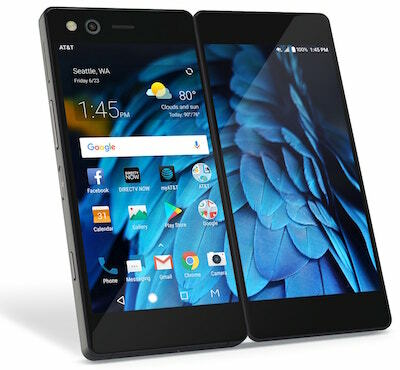 The Axon M screens can function in multiple modes and orientations. It is one of the first smartphones that has fully foldable screens for phone or tablet like use. Through speed tests around the Western US, it did a nice job of quickly streaming video and surfing the web on AT&T’s nationwide advanced LTE wireless network. ZTE’s AXON M came pre-loaded with Nougat 7.1.2 and Google’s Android security patch was received on February 25th for the January 5th, 2018 update. 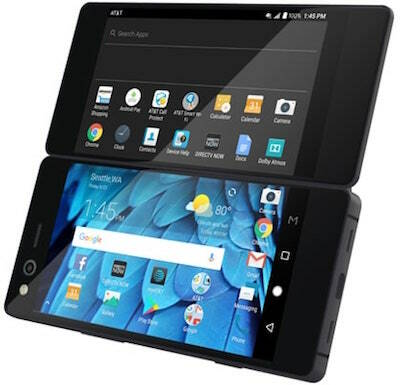 The AXON M comes with access to AT&T’s advanced 4G LTE wireless cellular network. It performed very well while surfing the web, playing YouTube videos and multitasking with multiple apps, on its alternate screen. Its two screens are made of Gorilla Glass 5th Gen, which is needed, as it does not have a non-glass surface to set it down on. Disclosure: I received a ZTE Axon M at no cost for review. I am an AT&T Wireless Brand Advocate Ambassador. I have not received compensation for this review. All thoughts and opinions are my own. Photos are courtesy of AT&T or ZTE, unless otherwise stated. Large top and bottom bezels allow for a 20MP forward-facing camera with electronic image stabilization and a flash. Its camera has the ability to record 4k/30fps video and the high-speed CPU is capable of 4k/60fps video playback. Curiously, its second screen has the same size bezel with no 2nd camera or a super slow motion video recording option. Most smartphones typically come with two cameras, one on each side. Its quad-core Snapdragon CPU and imaging software make for taking photos quick and easy. The quick launch button on the side can be programmed with a single press to open a TV app for DirecTV NOW, HBO Go, or YouTube. Two presses of the same button opens the camera app and flips its active screen to the rear screen. This allows for using the camera in a more familiar layout. After several days of use, the double press stopped working multiple times and the phone needed to be restarted in order for the functionality to return. The second screen allows for a mirror mode, to display the same content for two users at the same time. Unfortunately, the second screen is dimmer than the main screen and I could not find a way to adjust its brightness independently. The layout for the various photography modes are similar to the iPhone’s and offers automatic HDR too. This is a huge plus for when you do not want to think about taking photos in various lighting conditions. When tapping to focus, a white balance slider appeared with an unlocked lock icon. To lock in the white balance, tap once on the lock. It can digitally zoom to a maximum of 4x. The only camera sensor is huge at 20MP, so your selfies should be some of the best out there. The metal sides made the phone feel solid, with a total of four antenna bands, two on top and two on the bottom to allow for Wi-Fi and 4G LTE signals. Its main screen had a larger than normal band of surrounding metal, but it was for good reason. The thicker band of metal fits inside a large battery, a USB-C port, Dolby Atmos enabled dual speakers and a 3.5mm headphone port, and a sturdy hinge. The phone does not offer water resistance or a Qi wireless charging coil, but it does have an internal RFID sensor for wireless payments. That will be useful with the newly announced Google Pay. The feel of its Gorilla Glass 5th Gen screens was great throughout testing. One knows it is a flagship phone when it comes with Gorilla Glass. I did not add a screen protector or a case for the review time to see how it would hold up to real world conditions. I counted only a few very minor scratches, though they were probably there before I received the lightly used test unit. Its left edge is where all of the buttons are located. The volume rocker is above the inset power button. The power button doubles as the fingerprint scanner. Thankfully, the Axon M’s QuickCharge 3.0 enabled USB-C charging port is in the middle of the bottom. A combination tray house the Nano SIM card and microSD slots. Near the bottom of the left side is its Quick Launch button. A quad-core 2.15GHz Snapdragon 821 CPU drives the ZTE AXON M with 4GB of RAM and 64GB of storage. That 64GB of storage will fill up quickly when recording many 4k videos. Its micro SD card slot can expand storage up to an extra 256GB. I like using Kingston’s 128GB micro SD compatible with speeds required for recording 4k video. AT&T pre-installed multiple apps to support its services for use on the AXON M. Some of those apps are AT&T App Select, AT&T Call Protect, AT&T Hot Spots, AT&T ProTech, Device Help, AT&T DriveMode®, Mobile Security, AT&T Remote Support, AT&T Setup & Transfer, Smart LimitsSM, Visual Voicemail, YPmobile®. A few of these apps can be removed so that 128GB micro SD expansion card becomes even more important. The ZTE AXON M comes with a wall adapter and a USB-C cable. I noticed that while in dual screen mode, the draw on the battery noticeably increased. Because this Android smartphone comes with QuickCharge 3.0 technology, it only takes about 15 minutes to bring its battery back to a full days worth of power. Pro tip, any smartphone can be charged faster via a wired adapter, if it is powered off. ZTE’s AXON M ships with Android Nougat 7.1.2 firmware and has finally received the most important January 5th, 2018 update. During my review time, it updated only once, so hopefully ZTE will eventually send out an Android Oreo 8 firmware. Several major security patches for the Spectre and Meldown vulnerabilities were announced since release and a Wi-Fi security hack called KRACK was patched in this latest firmware. 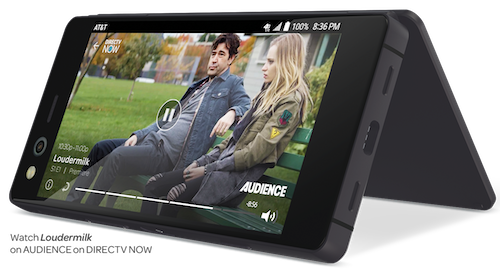 As previously mentioned, the ZTE AXON M comes with access to AT&T’s advanced 4G LTE network. After multiple speed tests in Western US cities, that included Las Vegas, Los Angeles, Sacramento, and Salt Lake City, I noticed excellent results in the 75Mbps to 120Mbps range for download and at around 33Mbps for upload on the higher end average. However, the signal strength outside of Sacramento, in a smaller town of 55k people, produced an average speed result of 5Mbps. The hotspot function, which can support up to 10 devices, did an excellent job of serving Internet to my iPad and other handheld devices. The speeds tests were completed with speedtest.net. The exciting news from AT&T is that 5G will be coming soon and its first city to be deployed in will be Sacramento. I am excited to test it with a future 5G device. Call quality was good in multiple environments due to its VoLTE or HD Voice capability. 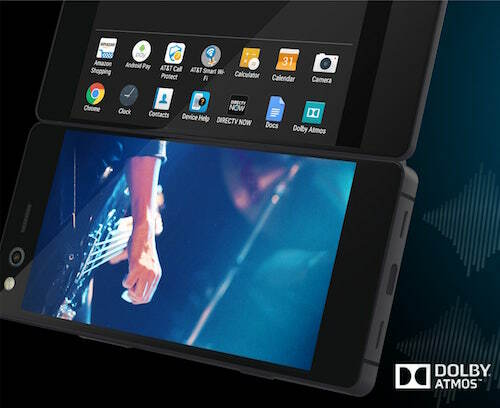 The AXON M also comes with dual-mic noise suppression by Fluence® to make calls even clearer. For accessing data networks, it comes with dual-band 2.4GHz and 5GHz a/b/g/n/ac Wi-Fi and Bluetooth 4.2 EDR/A2DP/HS/LE wireless technology. Bluetooth LE or Low Energy is what most of today’s smartwatches and fitness bands use. Some open AT&T Wi-Fi networks at various businesses recognize the active AT&T SIM in the phone and automatically sign into the network. AT&T should supply secure Wi-Fi hotspots or a VPN connection to the Internet when using their automatic Wi-Fi sign-in feature. Staying safe while on open Wi-Fi networks is always a good idea. Dual screens or folding screens is not a gimmick and is quite an innovation of technology. Kudos to ZTE for doing it well with a sturdy hinge, I get why its thicker than normal flagship phones. Check into ZTE’s Axon M Passport Program for an extended warranty option. AT&T exclusively carries the ZTE Axon M and is currently being sold at $24.17 per month O.A.C. for 30 months or $724.99 which requires qualified service. Check with AT&T for current prices and promotions. Its large 3,180 mAh battery kept two screens of entertainment going during multiple flights in one day and while traveling around to multiple cities, when back on the ground. The color reproduction and brightness on the main screen was slightly better than its second screen, so I used the main one most often. A 20MP camera sensor on the front produced very nice selfies. Though, I use smartphone cameras to record videos and to take photos for Instagram, Twitter and Facebook. ZTE’s inclusion of QuickCharge 3.0 was helpful to top up the battery before leaving the house in the morning or between flights with long layovers. The Android Nougat 7 experience was adequate and ZTE did an ok job of working with Google to enable dual screen app functionality. I appreciate that the company has tried something different, too many of today’s smartphones only include small interactive upgrades from designs that are several years old. I found the second screen to be helpful when checking email or sending out Tweets, while streaming videos on the main screen.